The United States Housing Market accounts for roughly 15% of the country’s GDP. This number may seem low, but as the country is coming off a very volatile 2016, it’s fair to say that the housing market hasn’t had its fair chance to meet expectations. In fact, the housing market is far from immune to the highs and lows of the country’s economic troubles. Since the real estate bubble, banks have had a tight hold on lending standards and guidelines. Now, in the wake of all of this, it appears things are beginning to level out. 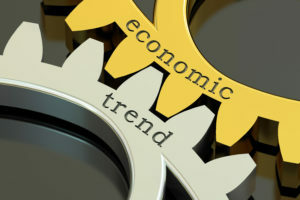 Here, LendPlus reviews two major economic trends we’re starting to see from the housing market this year. Through October 2016, prices consistently rose every month. In the latter half of the year, the largest national gain came in at 5.61% increase. According to Forbes and economic experts, these prices are expected to increase but gain slowly. The Federal Reserve raised the interest rates in December 2016, the first time since 2006. In 2017, we see another increase in the interest rates, possibly 3, causing mortgage rates to rise. Though it’s not expected to increase past 4.3, it is still higher than previous historical norms. Even though rates are on the rise, lending standards are likely to be let loose a little. This means mortgage credits are likely to be more available for potential borrowers. For first time home buyers, this is particularly good news. The Federal Housing Administration is likely to lower the fees for those buying their very first home. Additionally, Fannie Mae and Fannie Mac will begin backing larger mortgage companies, allowing easier access to homes for buyers in more expensive markets. This comes for the first time in over 10 years since the major economic recession in 2007/2008. In regard to the housing market, 2017 is going to see the beginning of a good leveling out, with some increases where needed. Buyers may experience a gradual increase in interest rates, but more medium sized cities are beginning to develop and the increase in available credit makes it possible to buy into these areas.